Trello is one of the most popular kanban-style project management software tools due to its simple interface and budget-friendly plans. However, it lacks features like reporting and task dependencies. We evaluated a dozen project management apps filling these gaps based on ease of use and affordability to come up with the six best Trello alternatives. We considered the best Trello alternatives that also featured easy-to-use kanban-style project boards as well as a variety of factors like how well they handled different types of projects and what team management features are included. We especially looked for options that offered features missing from Trello, like reporting and team permissions. Finally, we evaluated the support and training provided, as well as affordability for both individuals and teams. Price: We looked at the plans available and how well they fit into the budgets of small businesses, and especially whether a free plan was available. 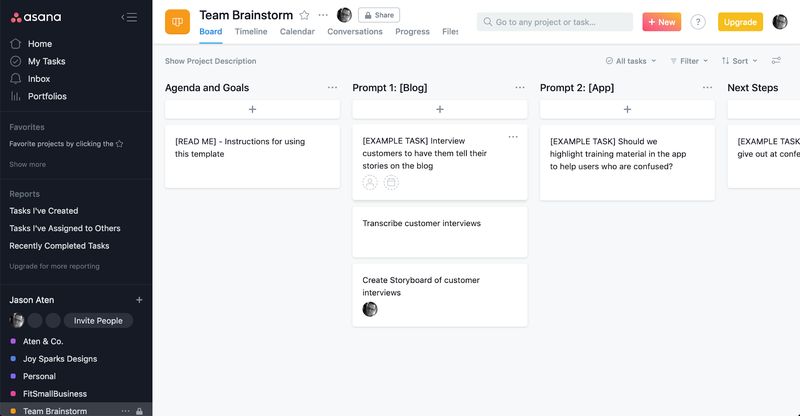 Kanban-style project board: Trello is known for its simple card-based interface, and we looked at alternatives based on how the software manages projects and whether or not users are able to display and move tasks through a process. Ease of use: How easily users can set up new projects, what templates are available, how easy it is to customize the interface, and what reporting is available to monitor project status and performance. Alternate project views: What additional project management layouts are available, including Gantt charts, task lists, and timelines. Mobile app: Whether the software offers a mobile app, and what project management functionality is available on the go. Team and permissions: We considered how easy it is to manage projects across teams, set permissions and deadlines, assign tasks, and monitor overall team progress. Integrations: Third-party integrations provide enhancements like accessing files, documents, time tracking, and customer relationship management tools. We recommend Asana as the best overall Trello alternative because in addition to kanban-style project boards, it includes the ability to easily organize projects based on teams or departments, manage team members, and receive notifications on upcoming tasks. Asana also has a free plan for up to 15 users, and includes a mobile app, making it easy to manage projects from anywhere. Asana is a project management tool with kanban-style project boards, team management tools, a robust library of integrations, task assignments, and notifications. Asana is free for teams up to 15 users, with premium features that include reporting, custom fields, task dependencies, and private projects starting at $9.99 per user, per month. We chose Asana as the best overall choice for teams that use kanban-style boards and need reporting and additional project views. Asana offers a free plan that includes project management tools for up to 15 users. Paid plans starts at $9.99 per user, per month, which is comparable to other options we considered. The free plan and the low-cost paid plans make it an affordable choice for dedicated project management software, including reporting and task assignment. Asana’s Basic plan includes unlimited tasks, kanban-style project management, team conversations, and task assignment functionality for up to 15 users. 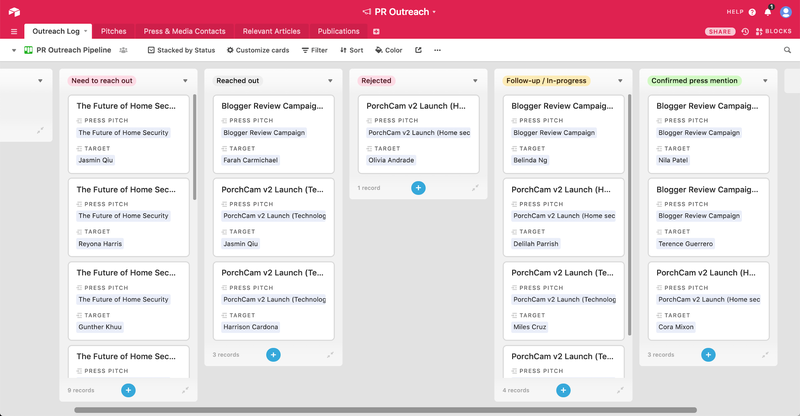 This plan is similar in functionality to Trello except that it also offers list views for tasks in addition to kanban, as well as calendar views giving users more control over how they manage their projects. Customer support is limited compared to the paid plans, but in line with other free options. While the Basic plan doesn’t include advanced search, administrative controls, or priority support found in the higher-priced plans, it does include a similar feature set to Trello, as well as the other free versions on this list, like setting task deadlines and attaching files. This plan is the best choice for teams of up to 15 members who need core kanban project management features at a low cost, with the flexibility of lists and calendar views. The Premium plan costs $9.99 per user, per month, and adds advanced search, priority customer support, reporting, timeline project views, and task dependencies. Users are also able to create private team projects and more advanced admin and team permission controls. The Premium plan is similar in price to entry-level paid plans on most of the options we considered, including Trello. In addition to allowing more users, the Premium plan provides functionality that makes it easier to manage project teams, and gives users access to an increased library of project templates. This plan is the best choice for growing teams that want increased reporting and permissions control, as well as timeline project views in addition to the kanban boards and lists. The Business plan is $19.99 per user, per month, and adds additional support through customized onboarding services. It also gives users advanced control over user permissions and data security. In addition, it adds a portfolio view, which allows users to group together projects based on teams or departments, and get a real-time, high-level view of each project status. While other options offer similar types of project overviews, this plan is designed for users who want to consolidate all of their company’s projects into one place, with the team management and progress tracking tools that help streamline your efforts. The Business plan is the best choice for organizations with multiple project teams and a large project workload, like software developers and manufacturing companies. Asana lacks chat and messaging tools to facilitate real-time communication within the software regarding projects, although it does include integration with Slack. Unlike Wrike, Asana is missing Gantt charts used for complex timeline and task-dependent projects, though it does include a timeline view, and the higher plan does allow dependent tasks. Users give Asana positive reviews, especially for ease of use and the online resources available for support and training. Users also like the project status updates features and the overall reporting features. Some users comment that Asana is more difficult to use on mobile devices than some options like Trello or Basecamp. You can find more about what users think on our Asana review page. Asana is the best Trello alternative for small business that want a flexible kanban project tool with team management functionality, reporting, and status updates. They offer a free trial of any plan, as well as a free Basic plan for up to 15 users. Paid plans start at $9.99 per user, per month, and include advanced reporting and project views. Visit Asana’s website to sign up today. Monday is a flexible project management software with kanban-style boards in addition to four other project view options. Monday also features extensive project templates, email integration, and cloud storage with plans beginning at $25 per month for up to five users. Monday is a great choice for businesses looking to manage customer projects because of its highly customizable project views and ability to add guest users. Monday costs between $25 per month and $59 per month, based on a combination of features and total users. This is more expensive than other options we reviewed for small teams, but comparable with the more robust project management tools we looked at for mid-sized teams. All of the plans include 24/7 customer support. Monday’s Basic plan is $25 per month for up to five users. This plan includes a kanban project view, 5GB of cloud storage, basic activity log, and 24/7 customer service support. Monday is based on an underlying spreadsheet view, which is different than Trello, and includes over 20 pre-set column headers, such as phone number, world clock, and status, allowing users to highly customize individual project boards. The Basic plan doesn’t allow users to create their own templates, nor does it offer integrations, which are both available on higher-priced plans. Compared to other options we reviewed, Monday’s price point is relatively affordable for an entry-level plan when you consider you are paying $5 per user, per month, which is less expensive than Trello or Asana. This plan is best for small and mid-sized teams that use kanban boards for managing internal projects. Monday’s Standard starts at $39 per month for up to five users, and adds 50GB of storage, timeline, calendar and map views, and unlimited activity log. This plan adds the ability to share boards with guests, which is an especially useful tool for businesses that manage customer projects. It also includes advanced search, email integration, and the ability to create templates from your existing boards. While this plan doesn’t include time tracking or some of the collaborative features found in Basecamp, it is a less expensive option for smaller teams. This plan also allows up to five integrations from Monday’s library of third party tools like Slack, Google Drive, and Dropbox. Because it allows guest access, this plan is a great choice for consultants, freelancers, and designers who regularly work on client projects but use a third-party tool for time tracking. Monday’s Pro plan starts at $59 per month, and adds unlimited cloud storage, additional views time tracking, custom tags, unlimited guests, and private boards. While Monday doesn’t offer advanced security controls or customized onboarding like Trello or Asana, it is an affordable choice for many teams, since this plan is only $12 per user, per month. It’s the best choice for teams that manage client projects and want to track team member time for billing projects. This plan an especially good choice for teams needing large storage capabilities since it includes unlimited storage, unlike Basecamp, Trello, or Asana, which require additional third-party subscriptions. Monday also offers comprehensive customer support, which includes an online knowledge base, phone and email support, and a VIP training package for an additional fee. Monday does not include client invoicing tools. It also doesn’t include any integrations on the Basic plan, which is a feature found on free plans from Asana, Trello, and others. Monday also doesn’t include any automation features for recurring tasks. Monday users give it high marks for the overall ease of use, and especially the customer service. Users also like how easy it is to customize and handle complex projects. Some users commented that large complex projects can be slow to load. You can read more on our Monday customer reviews page. Monday is a flexible and highly customizable project management tool with kanban views, guest access, and file storage. It’s ideal for businesses that manage customer projects, want to include guests, and organize files for each project. Plans start at $25 per month for up to five users, and they offer a free trial of any plan. Visit their website to start your trial. Airtable is highly flexible database tool that includes project management and spreadsheet functionality. In addition to kanban boards, it includes revision and snapshot history, real-time collaboration tools, and robust third-party integrations. Airtable is the best choice for businesses that want the flexibility of a database with the functionality of a collaborative project management tool. Airtable offers three pricing plans, each with unlimited databases. The free-forever plan includes 1,200 rows per database and 2GB of cloud storage for file attachments. Paid plans are $10 and $20 per user, per month, and include 5,000 rows and 50,000 rows, respectively. They also increase storage to 5GB and 2GB. The Free plan includes unlimited databases, which Trello does not offer at all, and allows users to create 1,200 rows per database. This allows users to keep track of both projects as well as contacts and other records. It also allows for 2GB of cloud storage per database and provides two weeks of revision history, giving users the ability to restore a database to a previous state. It also includes multiple project views and real-time collaboration tools. While Airtable is a primarily a relational database and spreadsheet tool, it includes kanban boards, allowing for highly customizable project management. One big advantage is that users can create multiple views within a project, making it easy to directly link project cards to contact records in the database. This makes it ideal for businesses looking for a basic customer relationship management (CRM) database and project management tool in one. The Plus plan is $10 per user, per month, and expands functionality to include 5,000 rows per database and 5GB of cloud storage space per database. In addition, the revision history is increased to six months. The Plus plan doesn’t include email integration or workflow automation featured by many other CRM software tools. However, this plan is comparably priced to other project management solutions with similar feature sets. Airtable is highly flexible, allowing users to link, share, and view their customer and project data in a variety of views. This makes it easy to visualize and track relationships between projects, customers, and team members. This plan is a good choice for creative professionals and other consultants who want an all-in-one tool to manage their customers as well as their projects, but don’t need long revision histories. Airtable Pro plan is $20 per user, per month, and includes 50,000 rows per database and 20GB of cloud storage space. It also expands to one year of revision history. This plan also provides users with a unique feature called Blocks, which allows users to add additional functions to individual databases like app integrations, contact importing, batch record updating, and a record list view. The Pro level’s customizable Blocks gives users the ability to add functionality available in other options, like Basecamp or Asana. The Pro plan is similar in price to the top plans from Asana, Trello, and Zoho Projects, with a flexible set of database features not found in any of those options. This plan is ideal for marketing or PR agencies that want to keep track of their customer projects in a flexible database tool. 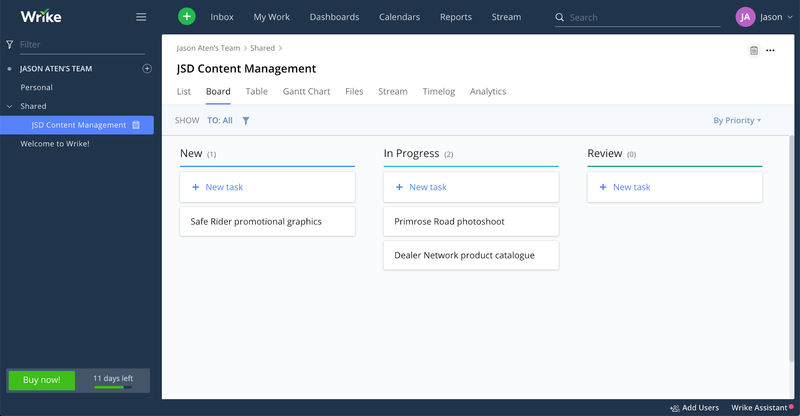 Airtable is missing some of the more advanced features in both standalone CRM and standalone project management tools, like one-click data import and export. It also lacks time tracking and invoicing features, as well as document creation, which is found in Basecamp. Airtable reviewers give it positive marks for overall ease of use and customer support. Users also like the revision history, which makes it easy to revert to earlier versions when mistakes are made. Some users find it a little overwhelming due to the fact that it is such a broadly-focused software tool. Airtable is a flexible database tool that functions both as a spreadsheet and a project management tool. It’s ideal for businesses that want a Trello alternative to manage both their customer database and projects in one place. The company offers a forever-free plan and a 14-day trial of its paid plans. Visit Airtable’s website for details. Zoho Projects is a Trello alternative to project management that includes tasks, project milestones, kanban boards, and task dependencies. Zoho has a free-forever plan for up to five users, and offers paid plans at $20 and $40 per month. In addition, Zoho Projects is a part of the Zoho ecosystem of business software tools, making it the best choice for teams that want to integrate their project management with their overall business productivity suite. Zoho Projects offers a free-forever plan for up to five users and two projects, with core project features like task management, kanban boards, document sharing, and calendars. Paid plans are available at $20 per month for 10 users and $40 per month for 15 users, and adds subtasks, reminders, and Gantt charts. This plan doesn’t include subtasks or Gantt charts, both of which are available in paid plans, as well as plans from Wrike. It also does not include time tracking or project reminders, but Zoho Projects does allow Zapier integration to add functionality through third-party integrations. 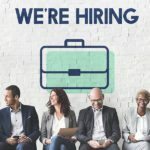 In addition, this a good choice for freelancers who need to use Zoho CRM and want to manage a few projects and keep them connected their customers. The Standard plan is $20 per month for up to 10 users, and increases the number of projects that can be created to 10. For smaller teams, this plan is more affordable than Asana, Basecamp, or Wrike, and offers similar functionality like subtasks, reminders, and time tracking. The Standard plan provides 5GB of project storage, and allows users to create up to five templates for commonly used project types. This plan offers a smaller number of available projects, compared to other options, but is one of the more affordable options for small teams that want to focus on managing kanban and Gantt projects. Zoho Projects supports 17 different languages, including English, French, German, Japanese, Spanish, Chinese, and Korean, making it a good option for international teams and remote workforce teams. The Express plan is $40 per month for 15 users, and additional users can be added for $3 per user, per month. The biggest difference in this plan, compared to the other Zoho plans, is that users can create unlimited projects, create 10 project templates, and can access up to 20GB of cloud-based storage. In addition, users can create custom views, add recurring tasks, and set up approval for time sheets. Zoho Projects includes an online knowledge base as well as email and phone support. Customer support is also available on social media via Twitter, a unique feature in the options we reviewed. This plan also integrates with Zoho Invoice and Zoho Books, making it the best choice for teams that need integrated time tracking and client billing. Zoho Projects does not have the same level of pre-made project templates available in Trello alternatives like Asana, Airtable, and Monday. In addition, it does not have built-in proofing or document revision features like Basecamp. It also lacks the ability to add additional projects in the lower tiers, making Monday a better option for businesses that need unlimited projects. Users give Zoho Projects relatively high marks for the overall price and core feature set. Users like the ease of use for distributed teams, especially across languages. Zoho users also appreciate how easily it integrates with other Zoho software like the CRM and social media tools. Users thought it was intuitively designed, and the mobile app included good functionality. Zoho Projects is a popular Trello alternative that includes project feeds, kanban boards, and integrations with productivity software and customer management tools. Zoho offers a free-forever plan for up to five users, making it a great choice for freelancers looking for a simple way to manage a small number of projects. Visit Zoho’s website for more details. Wrike is a powerful project management tool with task-dependent project timelines and multiple project views, including kanban boards and Gantt charts. Wrike is a Trello alternative offering a free-forever plan, with paid plans beginning at $9.80 per user, per month. The advanced project management tools, including nested projects, make it a good choice for teams that manage hierarchical, timeline-driven projects like marketing campaigns or media production. Wrike offers a free-forever plan for up to five users, and includes kanban-style boards, task management, and 2GB of cloud storage space. Paid plans range from $9.80 to $24.80 per user, per month, and add advanced integrations, subtask management, Gantt charts, and advanced reporting. Wrike’s Free plan provides task management, kanban boards, and a real-time activity stream for up to five users. In addition, this plan includes a spreadsheet-style task view, file sharing with 2GB of storage, and basic integrations with Google Drive, Dropbox, iCal, and OneDrive. These features make the free plan one of the more comprehensive options we considered. This plan does not include Gantt charts or subtasks, which are only available on the paid plans. This plan does include the mobile app, which allows you to create projects and assign tasks from anywhere, as well as view your upcoming tasks and track project progress. The free plan is not designed for hierarchical projects, and does not include timelines, putting it in line with Trello, but it does include 2GB of free cloud storage. This makes it a good choice for businesses looking for a free tool to manage projects and store files and attachments. The Professional Plan is $9.80 per user, per month, and is available for five, 10, or 15 users. This plan includes 5GB of cloud-based storage, and adds Gantt charts and subtask management. In addition, it includes additional collaboration features like sharable dashboards. This plan does not include time tracking, which is available on the top plan, but the overall feature set is comparable to similarly priced plans for other options we considered. The collaborators feature makes it easy to add customers, subcontractors, and individuals from other teams, at no additional cost. This makes it easy to use Wrike to manage cross-department projects, or to manage client projects. The subtask management allows you to create tasks that are broken into smaller pieces and assigned to your team members. These features make Wrike ideal for handling larger, complex projects like product design or software development. The Business plan from Wrike is $24.80 per user, per month, and adds the ability to customize both fields and workflows as well as real-time reporting and scheduled notifications. In addition, this plan adds time tracking and user groups, which make it easy to manage team projects and control permissions and access. The Business plan also adds 50GB of cloud-based storage, which includes up to 15GB of video uploads. While Wrike is slightly less streamlined than other Trello alternatives like Basecamp, it offers the most comprehensive project tools. Wrike also offers various add-on modules like proofing and digital asset management, which expand the project functionality and allow teams to manage both internal and external projects. These features make it the best choice for media production and content publishing agencies. Wrike is a comprehensive project management tool that includes most of the features mentioned in the options here. However, it is missing the ease of use compared to other, more focused options on this list. Wrike also does not include customer database features found in Airtable, and lacks some of the comprehensive templates found in Asana, Monday, and Airtable. Users especially like how comprehensive Wrike is and how easily it can be adapted to almost any type of project. Users also rave about the customer support provided by Wrike, although they mention that the software can be a little overwhelming. It’s great when a company provides great support, but sometimes you wish you didn’t have to use it so often. Wrike is a comprehensive project management tool that includes kanban boards, Gantt charts, and complex timeline project views. The timeline and subtask management features make it a great choice for businesses that need to manage timeline-driven, hierarchical projects like software development and media agencies. Visit their website to start your trial today. Basecamp is a popular project management software that offers unlimited access to all of its features for $99 per month. Basecamp includes up to 500GB of document and file storage, team collaboration, advanced reporting, activity tracking, and document creation. Basecamp is a great choice for businesses that want a centralized place to collaborate on projects and ideas, utilizing built-in document creation and editing. Basecamp is $99 per month for unlimited users and unlimited projects. The price includes every Basecamp feature and 500GB of file storage. 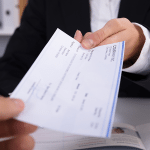 There is no minimum contract agreement, and discounts are available for nonprofit organizations. Basecamp’s pricing is about standard in the industry for businesses with teams of 10 or more users. 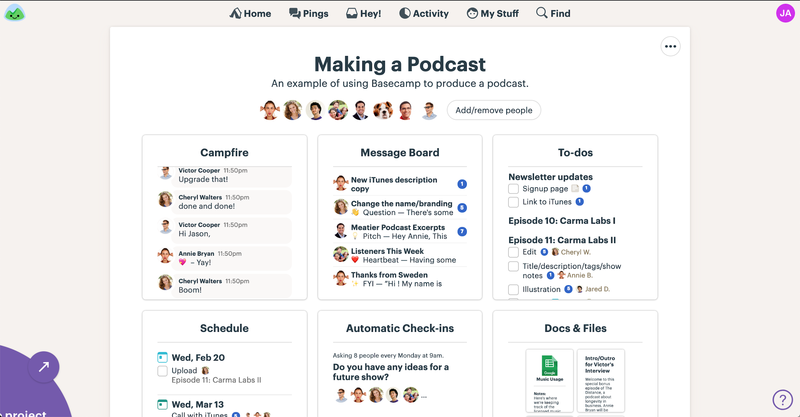 Basecamp’s features include to-do lists, message boards, schedules, 500GB of document and file storage, and tools to customize individual projects. Search tools allow users to sort data by keyword, image, file, and more. Other providers offer similar features but at a higher price point for options like increased file storage space or project customization. Basecamp includes real-time group chat and direct messaging features that facilitate team collaboration. In addition, users can set notifications on a task-by-task basis to control which team members are notified based on what tasks are completed. The interface also encourages team members to share what they are working on with check-in questions and updates sent to all team members in a single, easy-to-read digest. Basecamp allows you to add your client and control exactly what parts of the project are shared with them. You can keep internal project conversations and timelines private within your team, and then share the tasks, documents, calendar events, and files that require your client’s feedback. This feature is unique compared to almost every other option, except Monday, though Basecamp provides better control over who has access to what. Basecamp includes an activity feed that includes recent updates and project activity, like individual team member activity, files they’ve shared, comments they’ve posted, and work they’ve added to a project. Users can even choose to receive a daily email summary of all the activity on projects they are associate with. Basecamp also provides insight into what’s overdue and due soon, what tasks are assigned, what’s been completed today, and what’s coming up. Basecamp is highly intuitive with a well-organized interface that makes it easy to set up an account and get started managing projects. The interface is broken into various areas that are clearly identified, like to-dos, message board, schedule, documents, and files. Basecamp projects are highly social, and encourage collaboration and conversations, often eliminating the need for email and other tools like Slack. Basecamp makes it easy to create, share, and edit documents with the built-in editor. Users can create copy for marketing campaigns, websites, HR manuals, or other documents, share them with team members or clients, and make revisions as a team. Users can leave comments, make changes, and review contributions from other project team members, features that aren’t available in any of the other options we reviewed. Basecamp provides an extensive knowledge base and video tutorials that allow users to solve most problems on their own. They also offer regular webinars and online classes to help users better understand the basics. Basecamp offers customer support through online tickets, unlike Monday, which offers 24/7 support, and Trello, which features priority support to paid customers. Unlike the other alternatives we considered, Basecamp doesn’t include kanban views. It also doesn’t offer built-in time-tracking tools. While third-party integrations are available through software like Harvest, Monday is a better option for businesses that want these features built into project management. Users give Basecamp high overall ratings. Users like how flexible the project management tools are, how easy it is to communicate in real-time, and how much control Basecamp gives you when using it with clients. On the downside, some customers are disappointed that there is no way to visualize projects with kanban or Gantt chart views. For more user reviews, visit our Basecamp user reviews page. Basecamp is a comprehensive Trello alternative that includes project management and a team collaboration tool, with the ability to create and share documents from within the project interface. Basecamp is highly scalable, offering unlimited users and projects for one monthly fee of $99 as well as a free 30-day trial. Visit Basecamp’s website for details. We looked at dozens of Trello alternatives to identify the software that offer the best project management tools, including kanban boards, reporting, and team management functionality. We narrowed our list to these six that offer the best combination of features and value for small businesses. We chose Asana as the best overall Trello alternative because of its similar kanban board interface, ability to manage teams of any size, and premium features that include custom fields, advanced reporting, and task dependencies. Paid plans begin at $9.99 per user, per month, and Asana offers a free trial to try it out before you buy (in addition to a free-forever plan for up to 15 users). Visit their website for more information. Plan, organize & track in one visual, collaborative space!